Our goal is to help you decide whether this kind of trip is right for you. Let's start with the good news: Our trips are great fun. We guarantee that you will see incredible landscapes and meet wonderful people. We can also guarantee you the opportunity to get drenched by rain, baked by sun and covered by dust, sometimes all on the same day. That's the nature of this kind of travel. This isn't your Carnival Cruise. Our guides are experienced, diligent people but they can't predict what we will encounter on any given day. Expect the unexpected. Bring good gear, patience, and a sense of humor. Read what past travelers have to say at Client Comments. 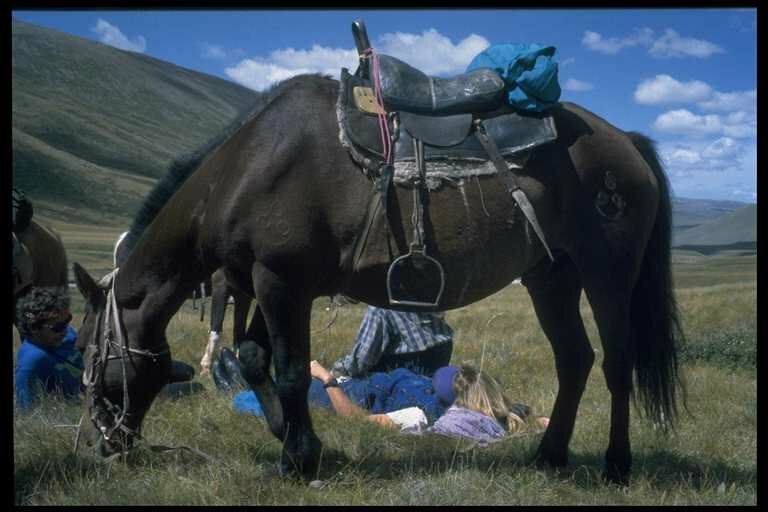 Mongolia, Tibet, Patagonia Riding Trips: These are wilderness trips, camping out at night in tents, sleeping on the ground, cooking over propane or wood fires. The stream is the bathhouse and the toilets are often a discrete rock or tree. While we make every effort to keep you safe, warm, well fed and comfortable (we have over 20 years of experience outfitting remote adventures like these) there is no escaping the fact that at times you may find yourself cold, hungry and uncomfortable. It is imperative that you speak with a trip leader or our office staff about the rigors of the trip, before signing up. Some trips have daily vehicle support, others are strictly self sufficient using pack horses. Like a trip in the Rocky Mountains 200 years ago, there are few roads, no fences and the people live in harmony with the land. For 7-9 days we spend 4-6 hours per day in the saddle walking and trotting with a canter thrown in whenever terrain allows. Refer to our gear list for a list of personal items and equipment you will need. There are plenty of opportunities to photograph, explore, fish or just relax. Mongolia Overland Trips: In Ulaan Baatar you'll be staying in a comfortable western style hotel with normal amenities. Outside of "UB", depending on your itinerary you'll either be in a "ger camp" or car camping. For more detailed information, click here. You'll be traveling in a 4wd jeep or van with a local, English speaking guide and a local driver. Uruguay: These trips offer a comfortable combination of horseback riding and non camping accommodations.. We stay primarily in inns, pensiones or other comfortable dwellings. Yes. Any travel in remote terrain, especially on horseback, river rafting or kayaking on large bodies of water has it's inherent physical dangers. We cannot guarantee your safety; we would be irresponsible to do so and you would be naive to believe us. We can assure you that your comfort, safety and the quality of your experience are of paramount importance to us and we bring 20 years experience to every trip we run. Horses are never totally predictable in their behavior and bad weather and rough terrain can compound safety concerns. Some of the riding is over very rough, steep ground and conditions can change drastically with the weather. At times we are several days from roads and even farther from hospitals. All wilderness travel is dangerous to some degree and each individual must decide if the rewards of experiencing new lands and cultures are worth the risk. Your trip leaders and wranglers take a conservative approach to riding, rafting and cycling with safety foremost in their minds but cannot guarantee that accidents won't happen. Hotels, ger camps, quaint inns, homestays and camping. On a given trip you may stay in a number of different accommodations. In Mongolia, when ger camps are available we use them, when not we use homestays or vehicle supported camping. In Tibet the camping is quite rugged with several days where we are traveling only with pack horse support. In Uruguay we stay in comfortable hotels and local inns. For more detailed description of hotels, inns, camping, ger camps and homestays click here. Sharing common interests is the best way to learn about different people and cultures. Love of horses and wilderness is the common thread we share with nomads. It is the intrinsic freedom in their lifestyle, vibrancy in their character and stunning beauty of their environment that prompts us to organize horseback travel among the nomads. Experienced riders and fit, willing novices go well together on our trips. We fit the horse to the rider's abilily and give you lots of leeway in terms of how, when and where you ride. These are not nose to tail trail rides; you can ride as much or as little as necessary to get to camp at days end. While basic riding experience is helpful, we have been joined by non-riders who either completed a basic riding course prior to the trip or demonstrated previous experience with active, rustic wilderness travel. Riding skill is not as important as attitude. We want to know that you are comfortable around horses and like riding all day. If you meet these criteria and enjoy wilderness camping you will do fine. For more on this subject, click here. What about the horses and tack? We ride on local stock, small (13 -14 hands), tough, working horses well suited to the terrain. Saddles include traditional Tibetan, Chinese, and Russian cavalry saddles. Here's one of our Mongolian made, Russian cavalry saddles. Travel in summer generally means warm weather, though the weather can change from bright sun to thunderstorm and back again several times in a day. We make a point of having raingear ready at all times. We carry roomy tents (2 people in a four person tent) for sleeping and gers are available which comfortably fit the entire group for meals and meeting in bad weather. Plentiful, tasty, basic. Mutton, rice and noodles form the basis of our diet, just as it does for the local people. Over the years our hosts have improved the trail rations to include some vegetables, eggs, peanut butter, cheese and even yak, now and then. If you are a vegetarian you must speak to the trip leader about your specific requirements. On all trips, single supplement is available when staying in hotels. In Mongolia we offer single supplement in tents. Contact the office for current rates or click here. Are there bandits or brigands? We are honored guests and our personal security is assured by ancient custom in China, Tibet and Mongolia. It is far more likely you will be robbed or assaulted in your hometown. We have had participants from 14 to 83. All applications are taken on a case by case basis. What is included in the trip fee? Most accommodations, meals, internal travel (vehicles, gasoline, drivers) horses, and group camping gear are included. Visas, tips and internal and international flights are not included. Please see specific trip itineraries for complete details. Virually all nationalities can obtain their visa on arrival at the airport in Ulaan Baatar, Mongolia. For the Tibet rides, you will need to obtain a Chinese visa before departing the US. Argentina, Venezuela and Romania do not require visas for US citizens. Tips for field staff (drivers, cooks, wranglers) and guides are optional and should reflect your satisfaction with the effort, enthusiasm and effectiveness of our staff. We prefer that tips be collected in two envelopes, one for field staff and another for guides. Per our company policy, field staff share tips equally with the exception of the cook who gets two shares. Guides give 15% of their tip to the office staff and split the remainder equally. If you want to say a special thank you to a specific person, please make a non-monetary gift. If you are traveling to border regions of Mongolia (Khovsgol, Ulgii) we will need a color scan of your passport face page to obtain border permits. When you send the scan by email to our office, send it also to your web-based email (gmail, hotmail, yahoo) so that you will always have access in the event you should lose your passport. Presenting a scan of your passport to the nearest US Embassy will facilitate issuance of a temporary passport. When we say hotels we mean modern western style accommodations with private bath, generally on a double occupancy basis. These are generally in the cities of Ulaan Baatar, Montevideo, Beijing and Buenos Aires. We chose hotels for the convenience of their locations, rather than the sumptuousness of their amenities. In Ulaan Baatar, the Bayangol and Ulan Bator hotels are in comfortable walking distance to the city center while the "fancy" hotel is a cab ride from everywhere. Single supplement is available most of the time at hotels. These are Mongolia's answer to the motel. While they vary (often year to year) in the quality of and service, all ger camps have the same basic format. You sleep in gers, the felt covered round tents of Mongolia's nomads, which have 2-4 beds, a table and a wood stove. A hot water thermos is available and sometimes you get tea bags as well. Then there is a bathhouse which always has sinks and showers and sometimes a sauna. Toilets may be incorporated into the bathhouse and flush with varying efficiency. Or toilets may be in a separate building or be of the outhouse variety. Next comes a large kitchen/dining hall, sometimes a newly constructed building, other times a converted structure and often a giant ger like structure. If you are lucky there may be a separate cantina/pool hall/ karaoke bar. If you are unlucky, you may draw a ger too close to said karaoke bar. Security is generally so-so at ger camps. Keep your important papers and camera with you even though you are provided with a padlock to lock the ger. (Many savvy travelers use their luggage padlocks in place of those provided by the management). All in all ger camps are comfortable, relaxed and offer a good break from homestays or camping while traveling cross country. However, they are not yet widely available, except near the hotspots of tourism like Kharhorin, the Gobi and Lake Khovsgol. If you actually get off the tourist track, you will likely end up camping or "car" camping to be exact. The jeep or truck you travel in will carry the components of comfortable camping; tents, sleeping bags, stoves, foodstuff, water, cooking gear.. and generally a cook.. We provide comfortable backpacking style tents, designed for 3-4 people but assigned to just two. Remember that even the best tent won't keep you absolutely dry when the weather is bad and the air very humid condensation can create considerable dampness. We also rent sleeping bags and pads through our UB office. For toilet we dig a latrine or for small groups, simply provide you a shovel, toilet paper and the opportunity to make your contribution to the greening of Mongolia at a distance from camp determined by your personal comfort and aesthetics. Bathing is done with a basin of hot water, prepared by your cook or at an appropriate distance from the nearest lake or stream. When on the road, we often camp near a local family and while sleeping in our own tents, make use of the family's ger as a dining and living room. Your guide will provide the raw materials for dinner or lunch and work with the local family to cook a meal for you and the host family. Homestays are a special opportunity in Mongolia to really gather some insight into countryside life. They work this way. Prior to your arrival, we arrange with a local family to have you or your group stay for a night or two. It's like camping but you have a big living room, the family's ger to hang out in and eat, talk, drink tea. But a homestay goes beyond the usual tourist formalities. It's only when you are past those formalities, when you start to blend into the latticework of the ger, that the family returns to the real activities of daily life. And that's when the opportunities to share and participate arise. We don't plan "activities" during a homestay so be prepared to be on your own initiative for entertainment.. even bored at times. The life of the nomad is actually pretty slow paced where at times all you do is watch the grass grow, or at least think and talk about how the grass is growing, where it is growing, whether it will rain too little or too much, which pastures are good, which are bad, the price of marmot skins and sheep skins and the taste of airag... You get the picture. In Uruguay and Patagonia we stay in small hotels or inns. Generally they are comfortable, basic hotel rooms with attached private bath.. or not. They are run by local people who attend us with the special interest of small business owners who are intrigued by our interest in their country, culture and of course... horses. A tiny ethnic minority occupies the borderlands of northern Mongolia with a lifestyle based on domesticated reindeer. The Tsaatan (reindeer people) live in tipi like tents, ride the taiga on their reindeer, are shamanists and are the rough equivalent of Native Americans in North America. Their culture and exotic, traditional lifestyle makes them a draw for any tourist. The Tsaatan aren't very convenient for the casual visitor. To visit them in their summer herding grounds requires several days of tough jeep and horseback travel into the Darhat Valley. Boojum Expeditions has worked directly with the Reindeer People since 1994 and arranges small group visits to the taiga. Boojum Expeditions is a founding supporter of the Tsaatan Community Visitors Center (TCVC) and cooperates closely with this grass roots organization when conducting trips to the taiga. Unfortunately, a family of fake Tsaatan take up residence each summer on the shores of Lake Khovsgol, where they are much more convenient for tourists with the dollars or euros necessary to purchase the right to photograph them. It would make business sense and dollars for us to turn a blind eye to this situation and actively sell visits to these charlatans. Instead, we offer you these facts (including the difficulty of visiting the genuine Tsaatan) and will let you make your own decision. The fake Tsaatan on Lake Khovsgol are a travesty; a multi-dimensional insult to everything we associate with "eco-tourism". The woman of the family now styles herself a "shamaness", although local people scoff at the claim. But she knows that's what intrigues tourists. The children are intentionally dressed in rags and encouraged to play on the sympathy of tourists for handouts and to purchase non-traditional "amulets" and other kitsch. The sideshow quality of this tourist experience is bad enough, but the real damage comes when roughly a third of the fake Tsaatan's "herd" of reindeer dies each year because reindeer simply do not tolerate the heat, flies and poor feed to be found on the lakeshore in summer. Worse yet, the reindeer carry brucellocis, a threat to endangered species like ibex and argali sheep which live in the strictly protected area of the Saridag Mountains and through which, each year, the diseased reindeer herd travels. It gets worse. Because the fake Tsaatan make so much money from tourists, they can afford to replenish the animals that die from the threatened stock of the genuine reindeer people. The family has a monopoly on this cash cow and protects it with threats of violence to any genuine reindeer people who think to also visit the lakeshore to be close to tourists. And finally, the majority of the local tourism companies turn a blind eye to the entire debacle because the presence of the fake Tsaatan provides a profitable day long excursion to see the "Reindeer People". As you may guess, we do not support or encourage visiting this fake family. If you insist on visiting, please, refuse to pay. The family has no authority to make you pay and you will just add to their arrogance and to the discomfort of the real Tsaatan. Traveling on horseback isn't rocket science. We have had many clients who had minimal or zero riding experience enjoy horseback trekking. Regardless of previous experience, anyone with good common sense, reasonable fitness and coordination and (most importantly) a good attitude and sense of humor can enjoy one of our horseback treks. • For those who have never ridden or ridden very little, we require that you take enough lessons to determine whether you actually enjoy the activity. We will talk to your instructor on the phone so that he/she understands the demands of the trip. We also want to hear from your instructor that you have good safety sense and are not intimidated or afraid of horses. We'll hold your deposit and your place on a trip while you do some riding and if you then decide it's not for you, we'll refund your deposit. • For those who have ridden a good deal but not recently, we strongly recommend that you get in some saddle time. You'll be more comfortable on the ride with some tune up of your riding muscles. If you follow the steps below, you'll make the transition your familiar tack to the foreign tack more smoothly. • Other cultures treat their horses differently than we do. In Mongolia and Tibet particularly, horses are working stock and are not treated like pets. While the wranglers all respect and value horses, they do not give them names or attribute human emotions and thought processes to them. Bring your love of riding, your sense of balance and leave the rest behind, planning to ride like the locals. Keep these in mind when riding in preparation for a trip. 1) Ride the smallest horses available. 2) Ride English. English saddles are similar in size to Mongolian saddles and will prepare you for the balance needed to stay securely on your horse. 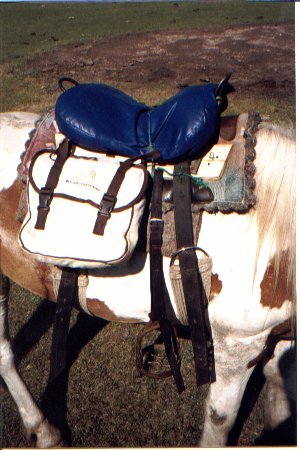 If you prepare for your ride in a Western saddle, a much deeper and more secure seat, you will initially feel less secure on the Mongolian saddles. 3) Get comfortable at a trot. In Mongolia and Tibet, we often ride for long stretches at a steady trot. Asian horses are small and it's nearly impossible to post the trot, so learn to stand in their stirrups or simply sit the trot or both. 4) Enjoy the canter. We canter whenever we're comfortable that conditions are suitable. While we do not require helmets, all levels of rider should consider riding with a helmet. It is important for each rider to weigh the advantages and disadvantages for themselves. Safety can become an endless quest, since any situation can be made "safer" by adding gear and rules. Being an alert but also relaxed rider is the most important element of riding safety.